Netherlands – Page 29 – iuoma.org – Interested in Mail-Art? 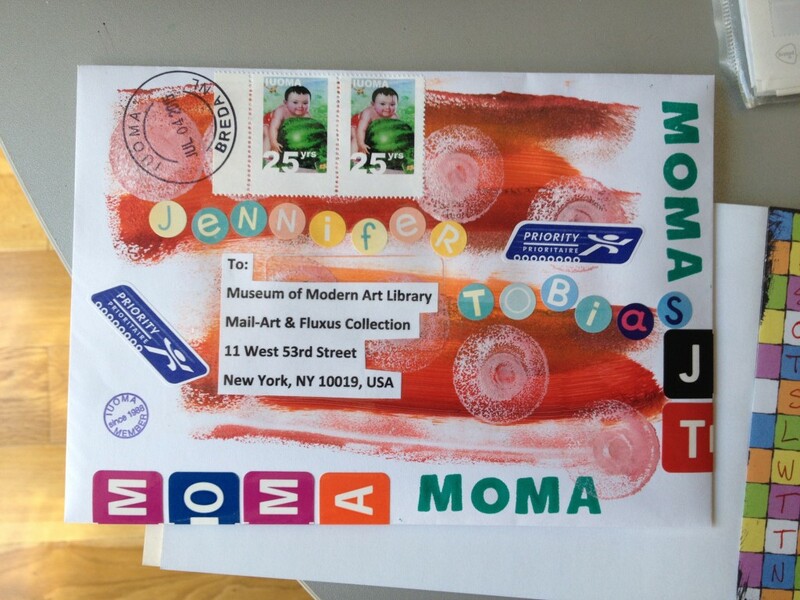 An envelope to the Moma for Jennifer Tobias. 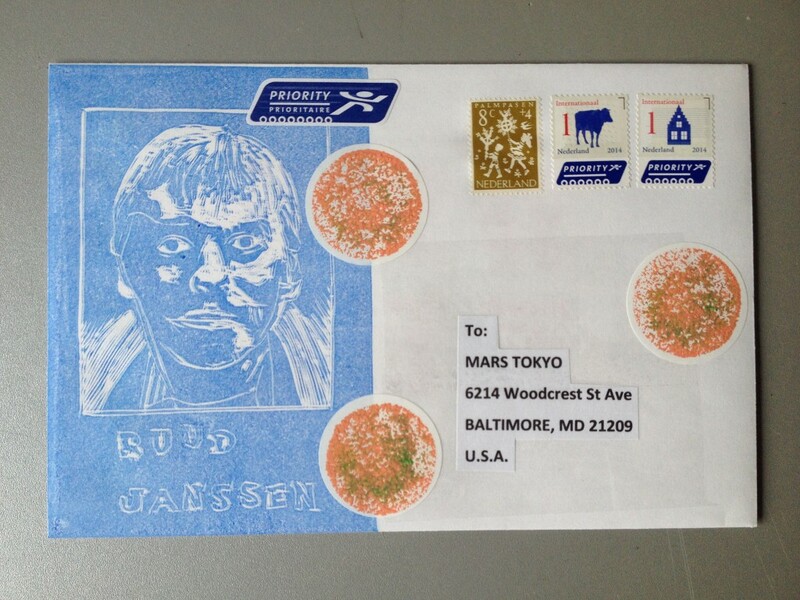 After scanning and sending I doscoverd that the postage stamps were missing. 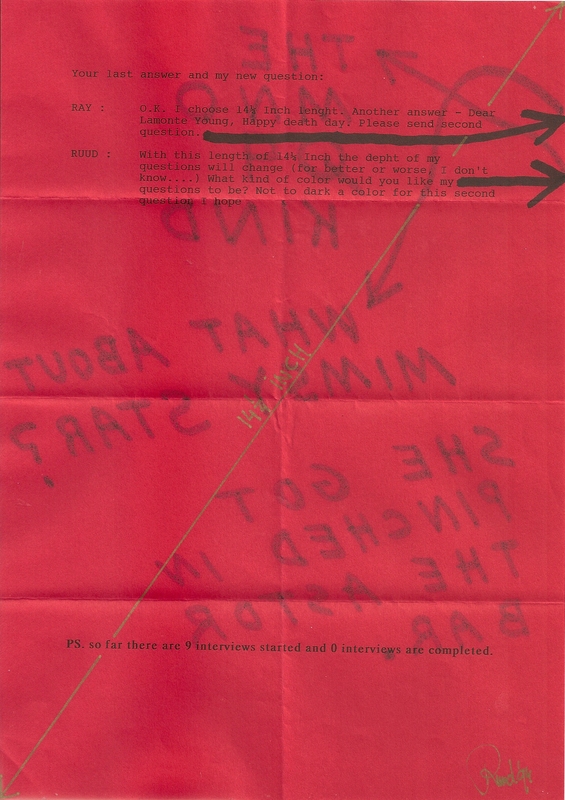 The artistamps were on it, but there is place for the original postage too…..
And to go back to the basic idea of Mail-Art, it was a way to send art from sender to receiver without having a need for a gallery of museum to show the work. Times they are a changing…. 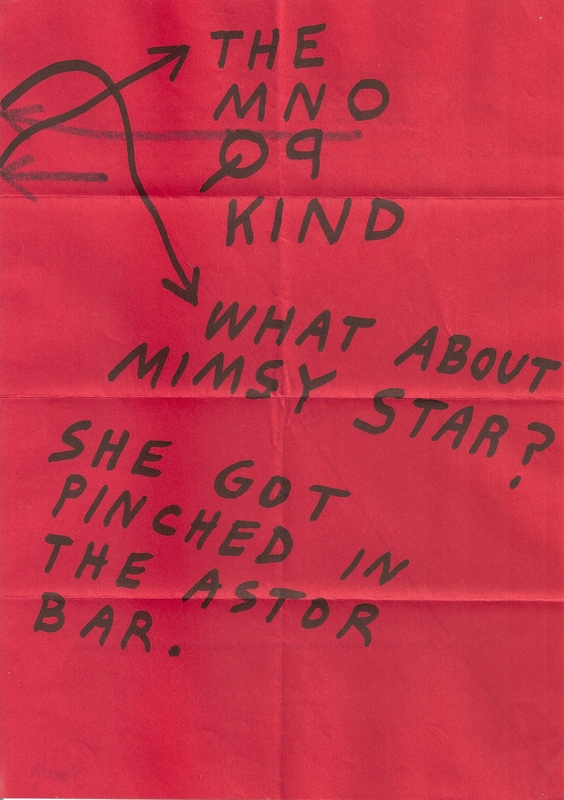 (c) 1997 by RUUD JANSSEN. 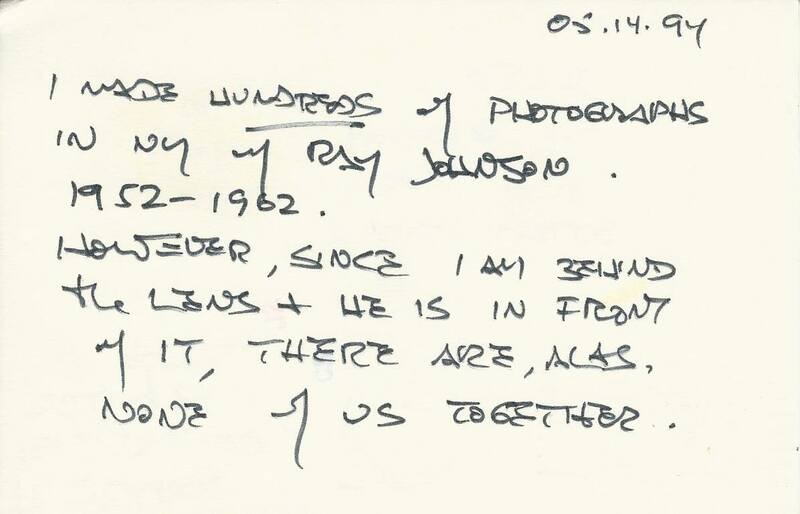 Originally this text was written February 1994. Life is a process of changes, at least it is like that for me. When I look back I can see how gradually these changes come about, but also I can see the real turning-points in my life. Only after those things have happened you can realize the full importance of things in your life. 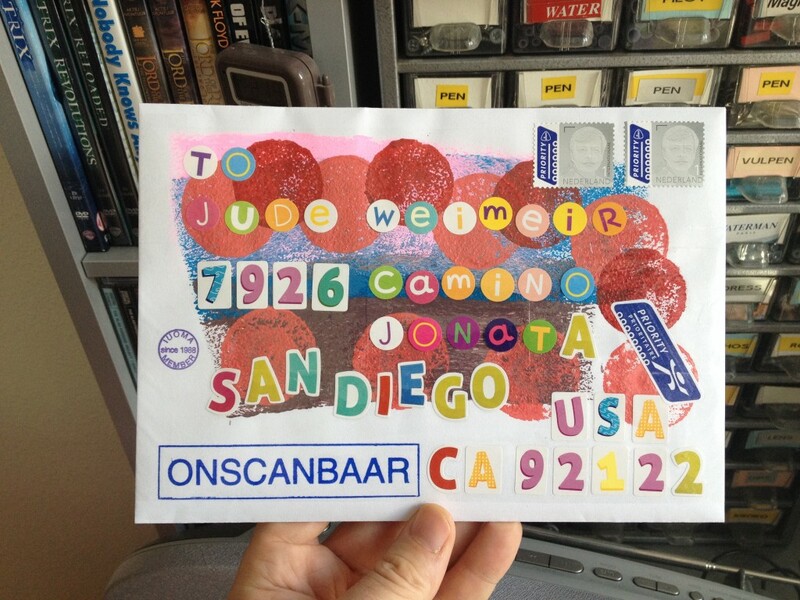 To my surprise, mail-art so far has speeded up this proces of changes, and also my view of mail-art is changing rapidly. 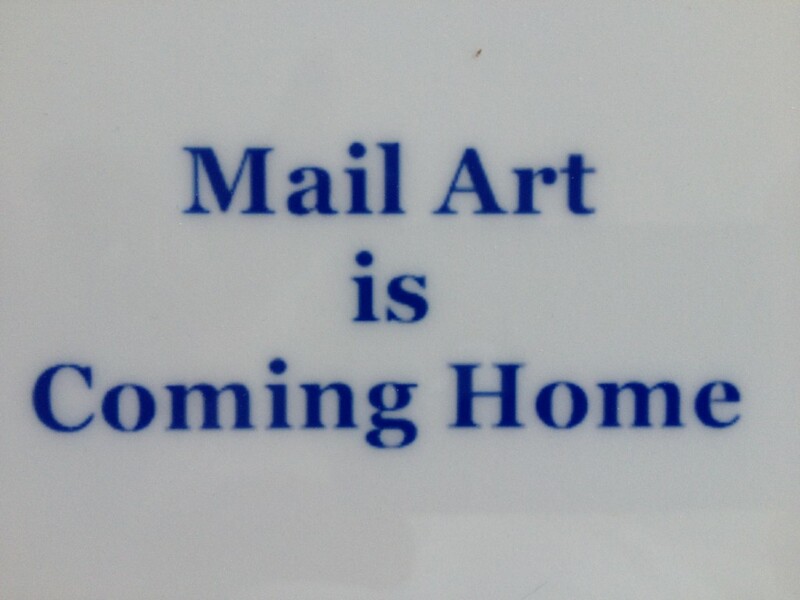 Surely also mail-art itself is changing in my eyes, but this is not an objective thing to say. 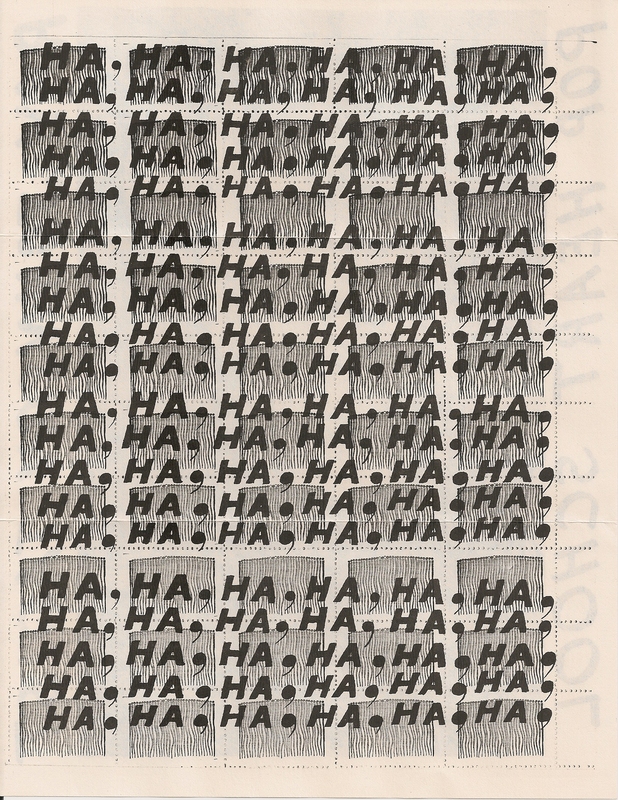 What I have learned through mail-art could repeat itself for someone else in another period of time. The mail-system itself hasn’t changed that much, although the way of life has……..
Evolution. 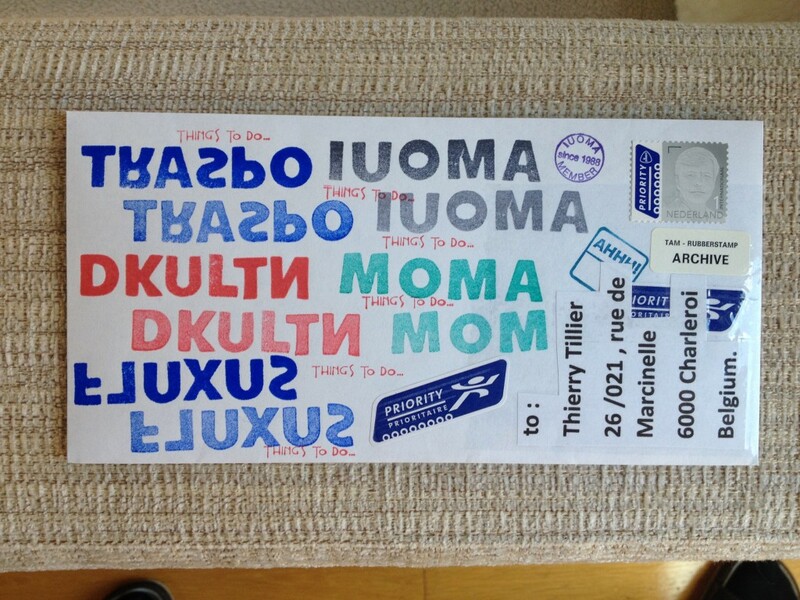 For me, for the world, for mail-art there is also evolution. In my perception mail-art has changed enormously. Only personal mail now triggers me to respond. 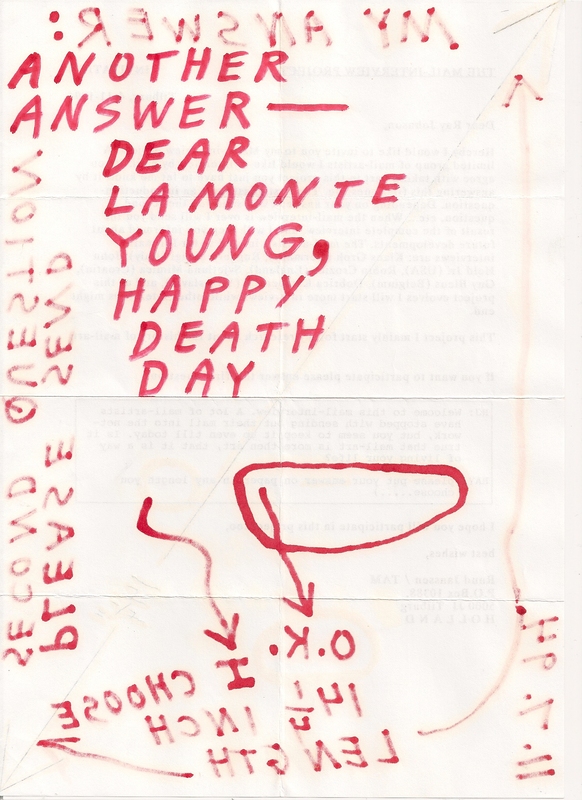 The xeroxes and chain-letters, the non-personal invitations to mail-art projects that look so much like that other project from years ago, the open letters with only my name written on top of the letter, and the rest turns out to be another xerox. It doesn’t inspire me anymore. I’m not looking for more contacts in the mail-art world, I’m only looking for time to do the things I would like to do. 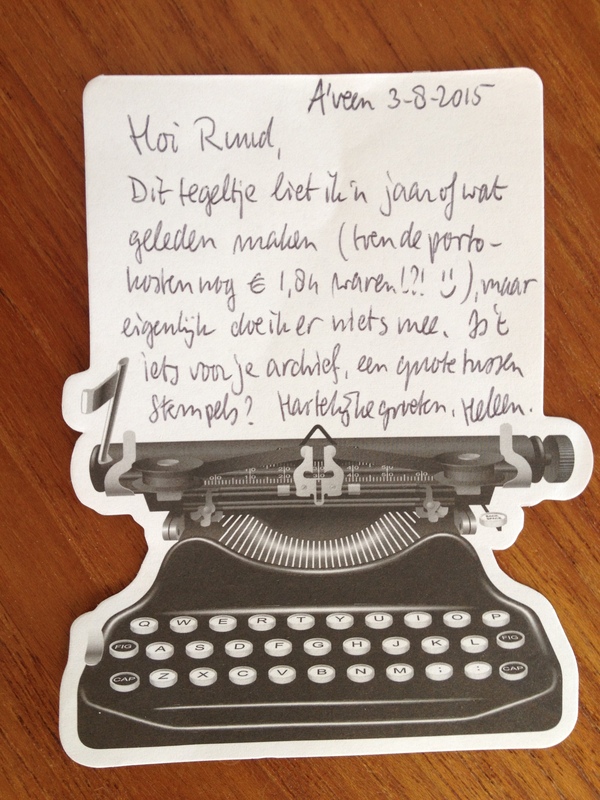 It fulfills me now more to write one long letter to a dear mail-friend, than to mail out 50 postcards on one day. I’m not interested anymore in keeping in contact with hundreds of people, but I value the personal contacts more then ever. It doesn’t matter if the mail is from a new or old friend, if it is personal I always try to answer promptly. Evolution. When I started to write this text I had an idea where it should be about, but while writing it, my thoughts have shifted again. As one gets older one thinks more about what is really important in once life. Is it success, being rich? No, I already found out (many years ago) that respect by others is worth more then mo ney. Friends are more important than being succesfull and well-known. Making something you like yourself is more important than making something that is liked by others. Yes, you learn a lot when you live. A pity only that not everybody lives in their life (according to my definition of living). Evolution. The process of changes. No mail-art anymore from East-Germany. Simply because the country ceased to exist. 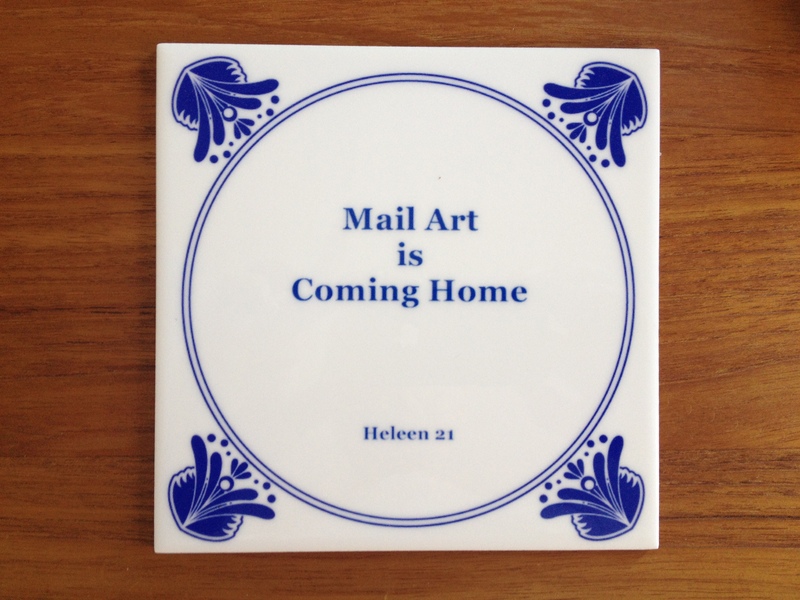 The mail-artists who lived there are still there, but their drive to communicate has changed. New ways are open, and their mail has changed. Hardly any mail-art from all those new countries (Russia, Ukraine, Sloveni a, Czech Republic, Croatia, Serbia, etc….) because the inflation just makes commu nication almost impossible. 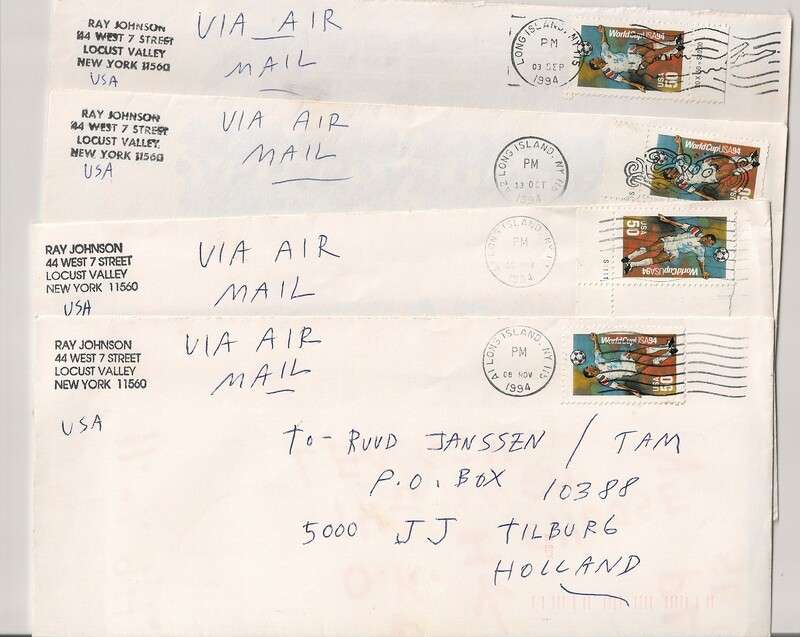 Still hardly any mail-art from Africa. Only when the war- zones are on television mail-artists sometimes write about the situation. Evolution. I don’t know how to write this letter. I probably print it a few times and will mail it to some of my close friends. Maybe they can help me with this story, and then I can change the text so I understand what I want to say…………….. Words are difficult tools when thoughts are changing. But words are powerful because the words in between the words you write are also there…. 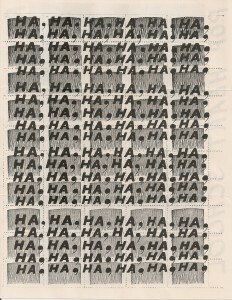 Chain-mail: A couple of years ago the mail-art network was flooded with these. According to Greenfield it has now become less. In my eyes it hasn’t. I think it has to do with if you participate in them or not. People who are looking for addresses to send copies to always look on older chain-mail products to pick a name….. But I agree that a couple of years ago it was really flooded. Visiting-phase: Started in 1986 , and in 1992 the congress-year. Mail-artists are on the move and try to visit each other. 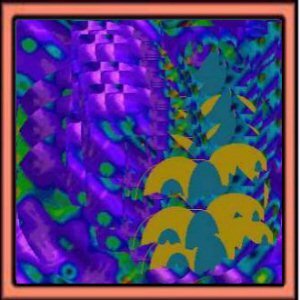 If the wish to meet is mutual , there is no problem , but some mail-artists ‘use’ the network to find places to travel to. 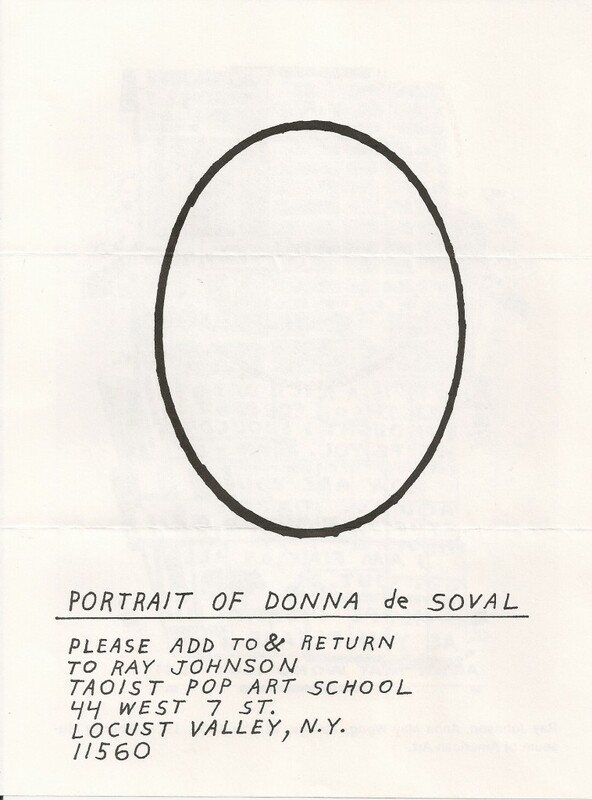 Buy this: People started to try to sell things through the mail-art network. I guess this phase will come and go every time again. 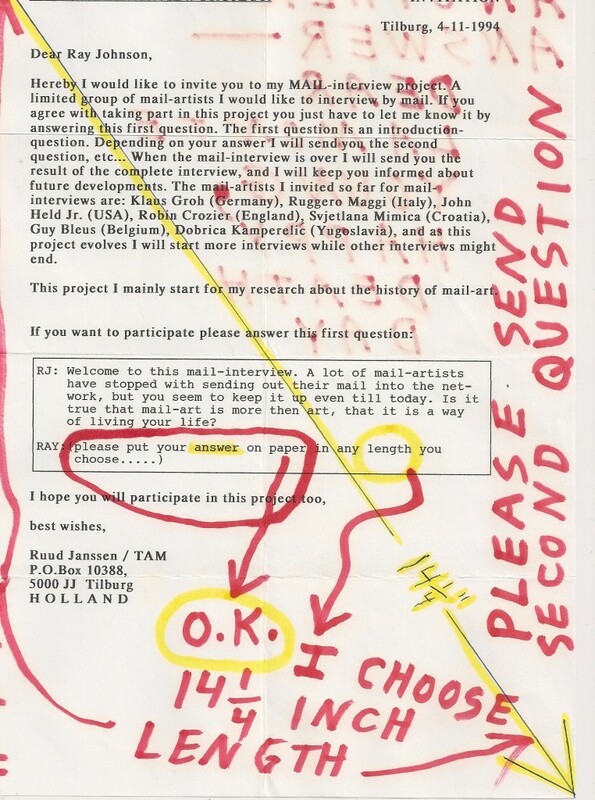 The old discussion of Lon Spiegelman (USA) , “money and mail-art don’t mix”. 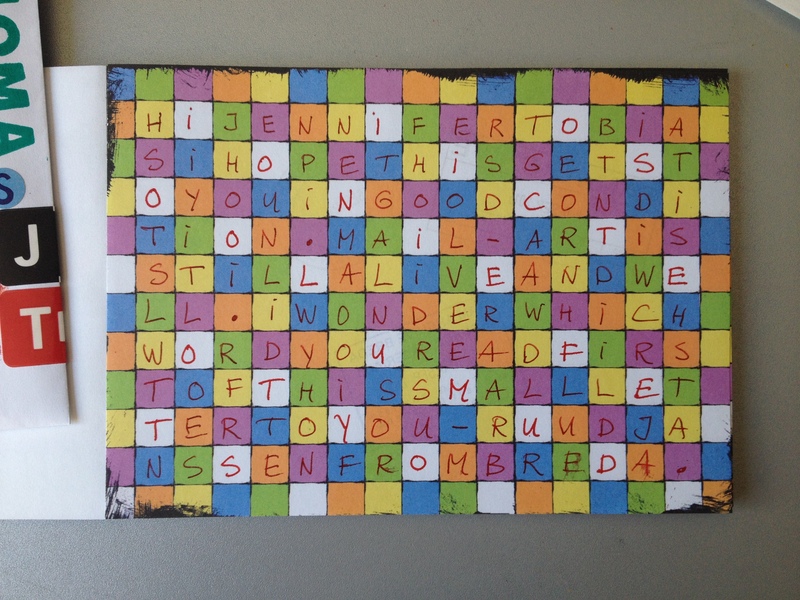 Fake Mail-art shows: People start a mail-art project , and promise lots of things. 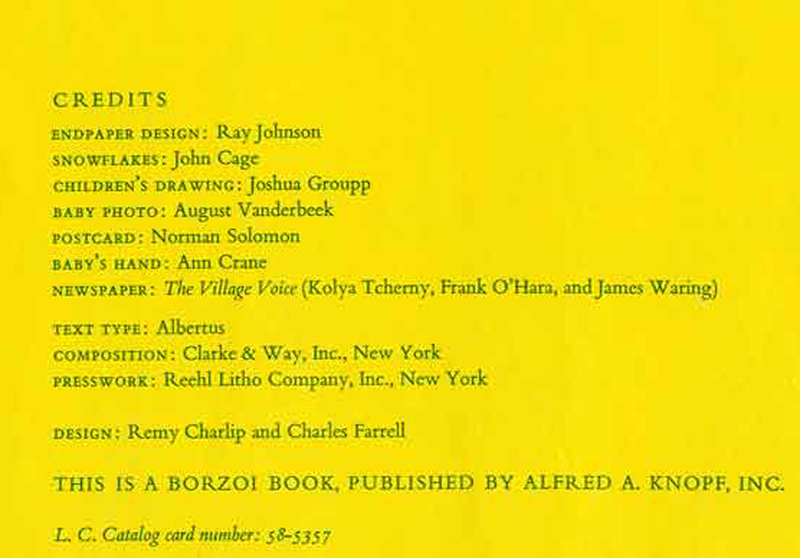 Finally the organizer makes a show and a wonderful catalogue and offers it for sale to participants. Greenfield hopes this phase dies out quickly. 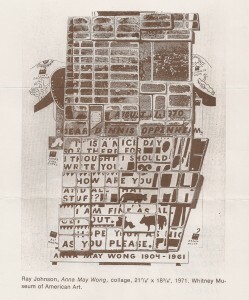 And it will when mail- artists just don’t buy the catalogue and ignore future projects of this person. Evolution. Mail-art has a certain meaning in my life, and I know it has another meaning to another person. There are a lot of networkers out there , but only the ones you like you stay in contact with. TAM / P.O.Box 1055 / 4801 BB Breda / NETHERLANDS. 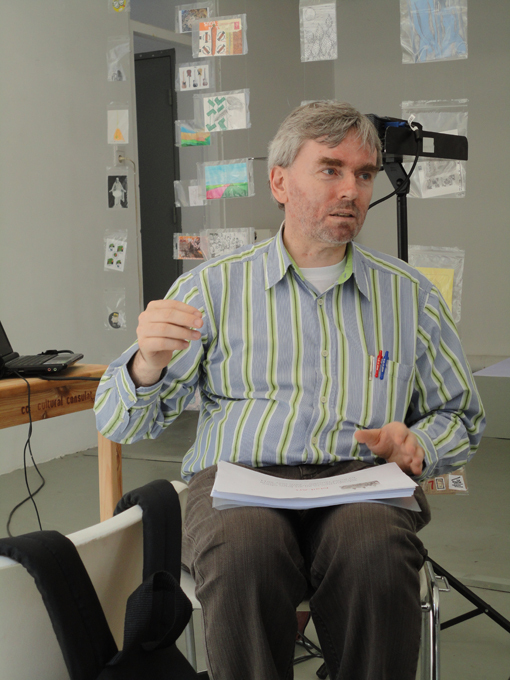 This is me, giving a lecture in the Hedah in Maastricht, Netherlands. Organized by Rod Summers. Round table discussion with amongst others Guido Goosens, Theo van deer Aa, Ger van Dijck and Rod Summers, broadcasted live on Amsterdam cable television as part of ‘De Hoeskteen Live a cross media workshop’ initiated by the Amsterdam artist Raul Marroquin.